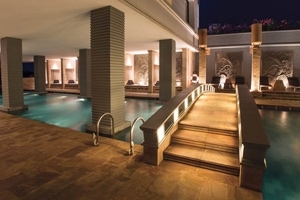 Deep in the heart of Siem Reap sits the towering Park Hyatt Siem Reap, a prestigious hotel that overlooks the city skyline, standing proud as an example of lavish comfort. 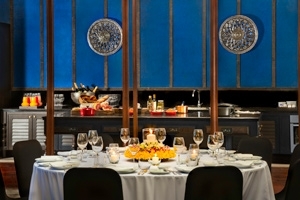 The accommodations are as beautiful as they are opulent, adhering to the needs of each and every type of guest, serving as the perfect hub for a memorable occasion in one of the most stunning cities in Cambodia. 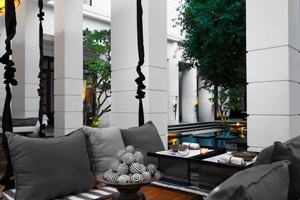 Fusing modern decor and pristine hues with a sense of residential charm and detail, the hotel employs a style that provides guests with the best of picturesque quality and extravagant grandeur that pay homage to the traditional overtones of Khmer and French colonial design. Located deep within the city centre, the hotel provides guests with a wonderful hub from which they are free to explore the bustling, culturally rich surroundings. 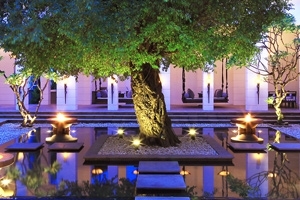 Some of the local highlights include a number of boutiques, various marketplaces and the Angkor Archaeological Park. 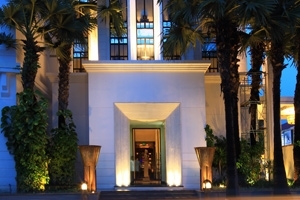 The Park Standard King Room offers guests 35sqm of accommodation space furnished with Khmer inspired contemporary art combined with summery hues and a spacious, marble bathroom for a soothing ambiance in luxury. 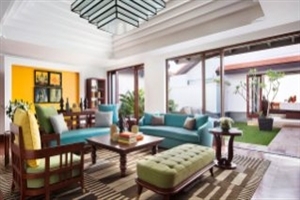 The room sports a separate living room and beautiful views over the lush courtyard or downtown Siem Reap. 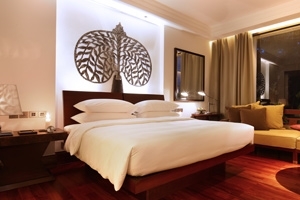 The Park Standard Twin Room offers guests 35sqm of accommodation space furnished with Khmer inspired contemporary art combined with summery hues and a spacious, marble bathroom as well as boasting views over downtown Siem Reap for an exotic ambiance in luxury. 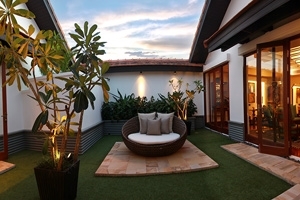 The Park View King Room offers guests 35sqm of accommodation space filled with custom furniture, Khmer inspired modern art and hues of summer throughout for a tropical ambiance. The room is gifted with a spacious marble bathroom and scenic views over the hotel’s lush courtyard for guest’s added pleasure. 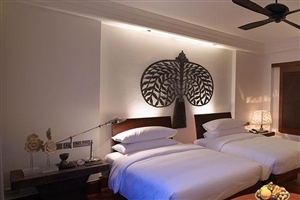 The Park View Twin Room offers guests 35sqm of accommodation space filled with custom furniture, Khmer inspired modern art and hues of summer throughout for a tropical ambiance. The room is gifted with a spacious marble bathroom and scenic views over the hotel’s lush courtyard for guest’s added pleasure. The Park Deluxe King Room offers guests 54sqm of accommodation space consisting of Khmer inspired modern art, summery tones and custom furnishings with glorious views over downtown Siem Reap and a spacious marble bathroom for maximum comfort. 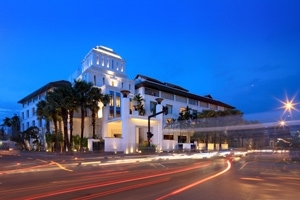 The Park Deluxe View King Room offers guests 51sqm of accommodation space consisting of Khmer inspired modern art, summery tones and custom furnishings with glorious views over the hotel’s lush courtyard and a spacious marble bathroom for maximum comfort. The Park Suite offers guests 71sqm of accommodation space in luxurious privacy, featuring summery decor, custom furniture and Khmer inspired contemporary art to create an overall sense of exotic comfort. 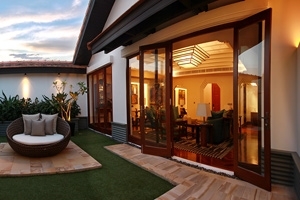 The suite boasts a separate living room, spacious marble bathroom and views over downtown Siem Reap. 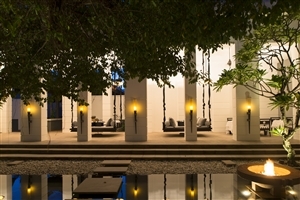 The Pool Terrace Suite offers guests 94sqm of accommodation space embraced in a summery decor and filled with custom furnishings and Khmer inspired contemporary art exuding a luxurious residential ambiance. 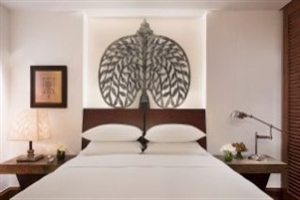 The suite boasts a separate living room, spacious marble bathroom and a patio that leads out to the hotel’s infinity pool. 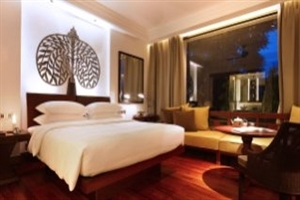 The Park Executive Suite offers guests 99sqm of accommodation space adorned in summery decor and filled with custom furnishings and Khmer inspired contemporary art exuding a luxurious residential ambiance. 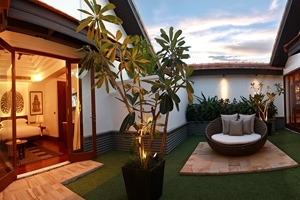 The suite boasts a separate living room, spacious marble bathroom, private plunge pool and easy access to the hotel’s lap pool and verdant gardens. 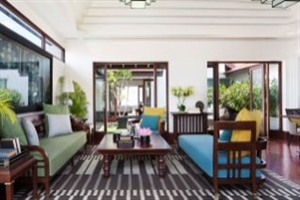 The Rooftop Garden Suite offers guests 152sqm of accommodation space in pure privacy and comfort, filled with Khmer inspired contemporary art, custom furnishings and summer tones to accompany the panoramic views seen from the private balcony. The suite features its own living space, spacious marble bathroom and private sun garden to enhance the sense of a secluded paradise. 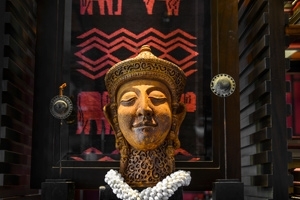 The Two Bedroom Pool Suite offers guests 182sqm of accommodation space that emanates an exotic resort-like ambiance with its Khmer inspired art adorning the summery toned walls. The suite houses a king and separate twin bedroom, garden, spacious marble bathroom and views overlooking the hotel’s plunge pool. 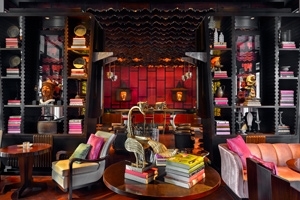 The Presidential Suite offers guests 248sqm of accommodation space in complete unfettered luxury. 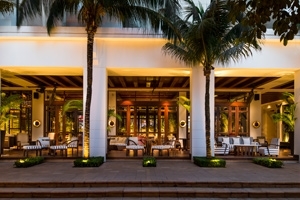 Featuring stunning Khmer inspired modern art, custom furniture and summery hues for an exotic resort-like ambiance with complete privacy assured. Complete with a spacious living room, dining room, marble bathroom and lush garden area, the suite is the ultimate utopia of comfort. 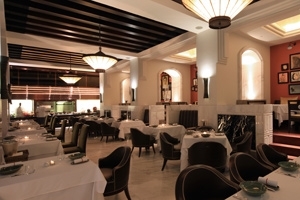 The Dining Room - Enjoy the flavours of French and Cambodian cuisine made from traditional recipes and ingredients. 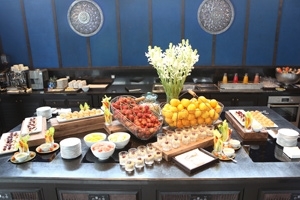 The Living Room - The chic bar lounge serves local or continental breakfasts, and comfort food throughout the day. The Glasshouse Deli. Patisserie - A conservatory styled eatery featuring a number of pizzas, sandwiches and ice creams to indulge in.